← Are You Ready To Dive? Scuba diving has always been associated with deep blue seas, glorious coral reefs, breathtaking underwater sceneries and psychologically, a momentary escape from the drudgeries of life above water. Not everyone can don the wet suit and take a dive in the open waters for the first time, though. It takes a lot of practice to be able to do this, apart from the required certifications. Perhaps the best way to start training for the big dive is inside a swimming pool, where the environment is controlled and there are no surprises for the novice divers. PADI (Professional Association of Diving Instructors) strongly recommends dive schools around the world to train students in contained waters before taking them out to open waters. One of the main reasons for this would be to combat the initial hesitation and apprehension of students about to dive for the very first time. Apart from the fact that training in a swimming pool is safer it is also easier for instructors to maintain control over the students’ equipment as well as their own. There is also the psychological aspect of diving to consider. People’s paranoia about sharks and other undersea creatures, fueled by Hollywood, does play an important role in the speed at which a student learns the nuances of breathing and staying calm underwater. Controlling the rate of descent and staying stable at the desired depth are two other important aspects that can be addressed in contained water dives. There are no extraneous waves and sudden currents that would affect the balance of the diver, and this makes life that much easier for the instructor in training the student. 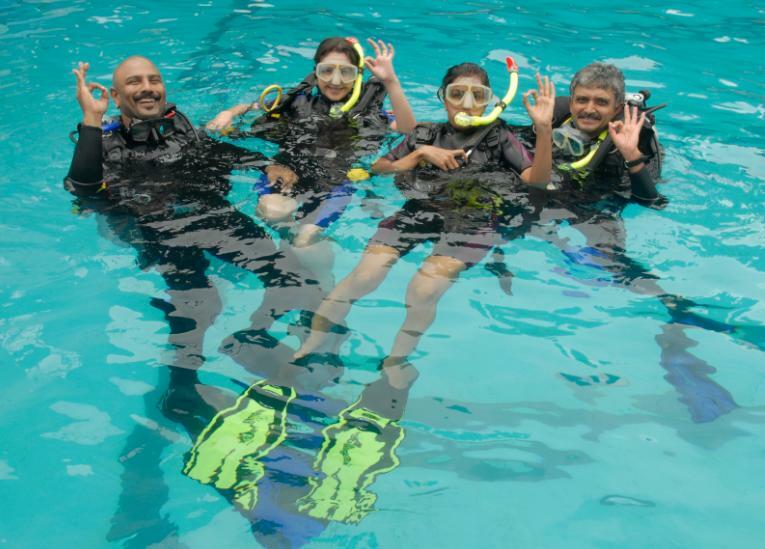 “It’s all a matter of what’s best for the students,” says Mr. Madhava Reddy, director of Planet Scuba India, which recently launched the country’s first inland scuba divind school in Bangalore. “Our PADI 5-star swim center complimented by the dive center at the KC Reddy Swim Centre and the expertise of out trainers makes our diving school one of the safest. Contained water dives are the best way and of course, the safest way for someone to learn diving and to build the required confidence to dive in open waters,” he added. Posted on September 15, 2008, in Uncategorized and tagged adventure, bangalore scuba diving, contained water, contained water dive schools, contained water diving, dive training, diving, diving bangalore, health, life, madhava reddy, PADI, planet scuba, planet scuba india, scuba diving, scuba india, sports, training. Bookmark the permalink. 3 Comments. I am interested in taking up a professional diving course which will allow me to teach and train people. Kindly provide information about diving schools in India. We are currently the only training school in either of the locations you have mentioned. Please give us a call to schedule you for the weekends. Our instructor should be able to customize a course for you. Thank you for the interest and for visiting the site!